Well, what can I say: Another shrug! I admit it, I'm hooked, literally! This is really nice looking. You have definitely mastered the shrug! In case you did not know, Interweave Knits has a new crochet magazine coming out for 2005. I got the one for 2004 and have yet to make anything from it. Here is a link if you are interested in checking it out. It is suppose to be on newstands September 7. 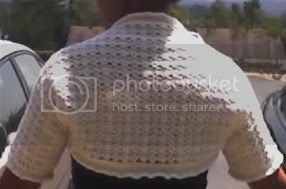 Very nice, you make pretty wearable crochet!